What do OxyContin, Evzio, and a chainsaw have in common? Continue reading about an honest mistake, and you will see. Naloxone reversal is not simply about resuscitating an addicted drug user. It’s about honest unanticipated accidents and saving lives. It’s about unsuspected drug interactions that unpredictably elevate opioid blood levels. It’s about medication errors; patient’s at higher risk of opioid toxicity that require high-dose opioids; patients with chronic diseases that take a turn for the worse; and new acute illnesses that affect opioid drug metabolism, drug elimination, breathing, and much more. Consider that thousands of people carry epinephrine emergency kits and some unfortunate people still die yearly from bee stings and other anaphylactic reactions. Nobody thinks twice about carrying an “Epi Kit” nor do third party insurance payers blink an eye to pay for them. But while thousands of people continue to die each year from opioid overdoses, the question of who should carry a naloxone reversal injector such as Evzio remains undetermined, but surely on the rise as a step in the right direction. Some of you will recall a previous blog presenting a video scenario of a young college student that manipulated an oral opioid narcotic and overdosed by injecting it. He was saved by his roommate with Evzio (auto-injector containing 0.4mg naloxone) reversal. Today’s post is another vignette with several learning points for chronic opioid patients and healthcare providers alike. This is a case of an honest mistake whereby an out-of-state husband (“Jeff”) and wife (“Annette”) each received legitimate prescriptions for oxycodone/acetaminophen 5/325 (Percocet) and OxyContin 80mg respectively. Identify a situation where husband and wife, both on opioids, could also be honest respectful citizens, even if they are from out-of-state. It just makes the pharmacist’s job more challenging. Differentiate between and opioid agonist and antagonist. 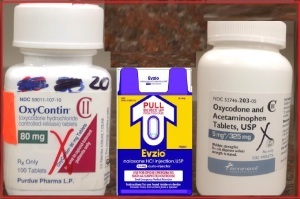 Evzio, as stated in the package insert, is an opioid antagonist indicated for the emergency treatment of known or suspected opioid overdose, as manifested by respiratory and/or central nervous system depression. Evzio is intended for immediate administration as emergency therapy in settings where opioids may be present. Evzio is not a substitute for emergency medical care. Describe a situation in which excess physical activity immediately after taking pain medication would be questionable. Justify a situation in which a pharmacist should comfortably be able to fill an out-of-state prescription. Yes, a pharmacist can fill an out of state prescription for a controlled substance in any state as long as they follow the law and take appropriate [verification] precautions. Specify the pharmacist’s legal responsibilities when filling a controlled substance. Like it or not, the pharmacist by regulation (DEA Federal regulation 21 CFR/1306) must adhere to the law, “…a corresponding responsibility rests with the pharmacist who fills the prescription.” Should a prescription fall outside legitimate parameters, “…the person knowingly filling such a purported prescription, as well as the person issuing it, shall be subject to the penalties provided for violations of the provisions of law relating to controlled substances.”A. This regulation is not intended to create a hardship for honest patients, nor is the pharmacist expected to use this as an excuse not to fill a prescription. b. I will maintain the highest principles of moral, ethical and legal conduct. In this video, you will see a pharmacy intern Jeff B taking prescriptions from pharmacy patron Annette. 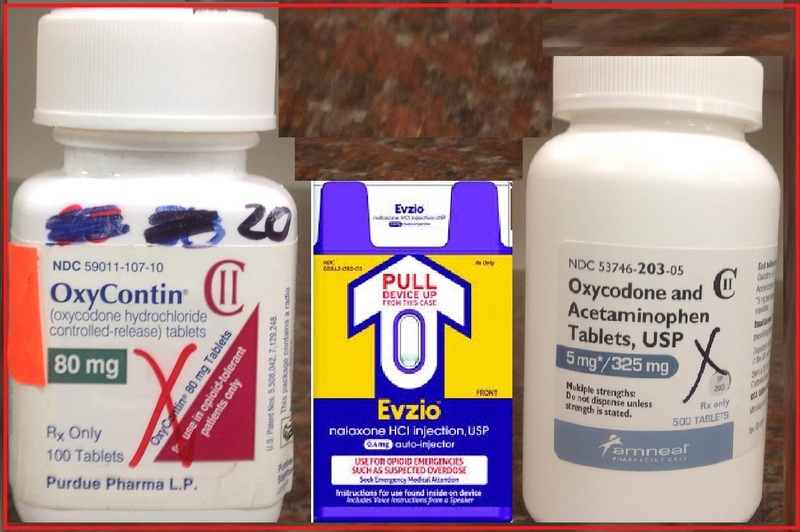 The prescriptions are for OxyContin 80mg, one tablet by mouth every 8 hours, plus a new prescription for Evzio auto injector, prescribed because there could be an inherent risk of having high dose opioids in a household with teens. In a twist of fate, although the Evzio was initially prescribed to prevent a teen overdose, Dad ended up close to death because of an honest mistake. Pharmacist, Thien cautiously checks the state monitoring system because both husband and wife from out-of-state have prescriptions for controlled substances as noted above within a very short time span. The pharmacist responsibly asks the correct questions of the patient, teaches the student pharmacist that high dose opioids are acceptable but only in patients that are opioid-tolerant and have been escalated over time with the proper precautions in place. He also counsels the patient. Annette leaves the pharmacy and responsibly teaches her children about the auto-injector after she leaves with her son “Devin”. In an odd “chain” of events, Annette’s husband Jeff F inadvertently ends up taking 160mg of oxycodone extended release (2 x 80mg tablets) instead of his prescribed oxycodone immediate release 10mg (2 x 5mg tablets). An honest, but almost certainly fatal mistake of taking SIXTEEN times the prescribed dose almost ended as another statistic! As they say in Show Biz, “TAKE 2”. Just make sure you take 2 of the right thing. And, if YOU want to create a video scenario as a public service to be posted on this Blog, contact Dr. Fudin, jeff@paindr.com. We especially encourage such participation from pharmacy, medical, NP, and PA students (not necessarily in that order). Dr. Fudin wishes to especially acknowledge Four Corners Pharmacy, and pharmacist owners Paul Pagnotta and John Croce for their professional support and allowing the participants to use their pharmacy for video recording. Jeffrey James Bettinger (played the role of Pharmacy Intern) attends Albany College of Pharmacy & Health Sciences, Albany NY. He is a Pharm.D. Candidate, 2017. Daphne Ann Freeman (videographer) is a junior at Voorheesville’s Clayton A. Bouton High School. Devin Gregory Freeman (played the role of “Devin”, son to overdose victim) is a junior at Voorheesville’s Clayton A. Bouton High School. *Annette Payne, Ph.D. (played the role of “Annette”, as Four Corners Pharmacy Patron and wife to overdose victim). She is a Clinical Psychologist and Chief of Psychology Service, Stratton VA Medical Center. *Thien Pham, Pharm.D. (played the role of Pharmacist) is a PGY-2 Pain & Palliative Care Pharmacy Resident at the Stratton VA Medical Center in Albany NY. Erica Lynn Wegrzyn (played the role of firefighter and video editor), B.S., B.A. attends Western New England University College of Pharmacy, Springfield MA. She is a Pharm.D. Candidate, 2015. * Participation in this project was not part of any official federal employee duties or any other participant affiliates. The filming was not done during regular work hours as federal employees, and this project was not reviewed by or approved by any government agency. The content of this blog was not approved by, reviewed, or supported in any way by OxyContin manufacturer Purdue Pharma or Evzio manufacturer Kaléo Pharma. It is solely provided as a public and educational service by Dr. Jeffrey Fudin and the participants herein. Can Staten Island’s middle-class neighborhoods defeat an overdose epidemic? Love it! Spot on. Proactive! THANK YOU. I will be sharing. I secretly fear Dr. Fudin is only going to take WNE pharmacy students on rotation if they are firefighters. Luckily we have another one in the Class of 2017! Not to worry – I’ll accept EMTs! Dr Fudin, i need advice on my current medical situation. I was diagnosed with vulvar cancer in april 2015 and it is progressing very fast. I been on suboxone for going in 4 years now, but i need to have surgery to remove cancer and the lymoh nodes in my groin. My oncologist knows nothing about suboxone and he is going to let my suboxone dr manage my pain (witha half of an 8/2 mg of sub every 12 hrs) i went through one surgery while on suboxone and it was horrible. The drs and nurses had no idea how to help me and i was in horrible pain. My suboxone dr told me to my face that if i want to live and be cancer free, then suffering in pain should be worth it. Im so scared and worried. He is totally against me taking anything for pain and he instructed my oncologist/ surgeon not to give me pain meds after surgery. I have put this surgery off and even if i tapper off myself he is still going to let me feel it. I have to have a modified radical vulvectomy with lymph node dissection b/c cancer has metastasized to other areas. Is there any info or anything i can do to keeo them from making me go thru all of that pain? my oncologist told me that he doesnt know anything about this medicine but he isnt trying to research it or help me either. Is there anything i can do? Good job you guys & two thumbs up! Looks like Evzio can be kryptonite even for Mr Murphy’s laws. I can actually see that scenario or one similar happening. I have 4 small round white pills that are all roughly the same size (prednisone 10mg (Cadista), methadone 10mg (Roxanne), metoprolol 50 mg ER (Actavis/Watson), diazepam 2mg (Teva). If you don’t look closely or have them separated in a weekly/day pill box they could easily be mistaken by someone, especially one who was elderly, sleepy, rushed, sleepwalking, or being helped by a caregiver. Exactly Coonhound. Maybe we need to take a road trip and have a filming session with all your white round tablets. Thanks for sharing! I never heard of Evzio and can see how that could be lifesaving if someone is around to administer it. I think the first thing I noticed is that the father just assumed that what his son handed him was the correct medication. I think that is where the mistake could have been avoided as he should have handed him the bottle so he could see EXACTLY WHAT HE WAS TAKING given that both parents had pain medication in the same location, which was an accident waiting to happen. Moral…Know what you are taking and always check because a lot of the pills do look alike and are the same color and similar size. Its become ridiculous to the point no one has any compassion at all for those that truly suffer from chronic pain accept for our doctor willing to write a script, then we cant get the thing filled. Your son should not be going thru this, it took 8 days to get my last script filled and this is unacceptable, its less than half of what I use to get and still I get that stair down from the pharmacist, him saying we have to order this and it will take a week to get it in and fill this script. I’m not about to do the pharmacy crawl again so I left this last script with the pharmacy . The pharmacist looked at me as if I was going to get angry and grab the script and go elsewhere , not this time, I’m done doing the pharmacy shuffle. We that suffer from chronic pain are not at fault for needing our scripts filled to live a somewhat normal life, so please don’t make us feel guilty as if we’ve done something wrong and are a pain to deal with. We didn’t choose this life ,it just the way our life turned out, as if we like to live this way and we are at fault in some kind of twisted way. Hello to all chronic pain brothers and sisters. Thank u to Drs Fudin and his colleague for the work that ur doing to re- educate society on why the need for pain medication and the respect that should be given to patients when they enter a pharmacy with a Rx for opioids. U literally are made to feel like a LEPER when u bring in one of these Rx’s. It’s humiliating and frustrating. We did not ask for chronic pain and deserve to have a quality of life. Due to the fear and intimidation a the doctors are under prescribing the meds and I’m struggling to deal with the pain after the 10mg have worn off. I just moved to Florida to get out of the cold weather. This is one of the most rigid states when it comes to pain medication. I do advocate for better guidelines but when those guidelines are followed and u r told by a pharmacist at ur local Publix pharmacy that they r not taking any new patients with Opiod Rx’s that’s a form of discrimination when u have other Rx’s that they r willing to fill for u. Where can we turn. We r going backwards to third world practices. We need help from the ADA with regards to this matter. We need a platform. Thanks again for being an advocate. If there is anyway that I can help please contact me. This has become my passion as I will have to live with this pain for the rest of my life. Welcome to Florida and the nightmare that chronic pain sufferers have to go through. I just want to clarify something you said about third world countries. I have a friend with chronic pain married to a doctor who is from Bangladesh. She told me that in those countries, you don’t even need a prescription and that you just go into the drug store to buy whatever you need and not surprising when you are in an enlightened society, they don’t have the abuses that we here in the land of the not free and home of the brave who from what I can tell are mostly hiding in their houses too afraid to speak up as there is such a horrible stigma when it comes to chronic pain! Speak up people and stand up for your friends too. When someone is in pain, believe it. This is the first I’ve heard of the auto injector for overdose. I was just switched from hydrocodone to oxcontin (a mere 20mg which seems wimpy compared to Annette here!) and I have two small kids in my house. At 7 and 4 they are past the “put everything I find in my mouth” staff and not quite to the “experimenting with drugs” phase. Curious about the recommended parameters to contemplate keeping this in the house. You raise a very good question. There really is no hard and fast rule about who should have one in the house. But, with kids in the house, it’s never a bad idea especially if there are overnights with their friends. But at the very least I’d make certain you keep your medications in a lock box or other very secure place. I sure wish the pharmacists filled pain medicine prescriptions in Florida like that. In fact, in Alabama as well, since I have second home there. No hassles but cautious and caring information to the patient in this video showing how pharmacy should be done. This is not happening here nor many other states now days. This used to be normal style procedure. Pharmacists just tell you they don’t have it, the doctor is out of the county, You live too far away and how many pharmacies do you pass getting here? We order it but it never comes in our delivery. Come back in 2 weeks, (the first of the month) we might have it then because we have met our ration for this month already. Then first of the month comes and the pharmacist says maybe try back Friday and by the way, that number needs to come down. Meaning the amount of pills needs to drop to almost half. The patient has already been reduced to please the pharmacist 5 months ago and the patient is suffering with extreme pain and withdraw right now. What does a patient to do at this point? The ER will not help. This is just what has happened to me trying to fill my very ill my sons medicine last month and again this past last Thursday. My son is bed ridden and can’t function at all because of chronic pain from chronic Lyme Disease, now withdraw symptoms too. I am so worried because I don’t know where to move to satisfy everyone? I need to move to a different home. Can I move to Alabama at my second home? No, there isn’t a specialist for my son there. Living in FL is hell because I can’t fill his prescriptions here because his specialist doctor is one county away. I don’t mind the drive as we live in a rural area because I have horses. They don’t understand this. Where is American freedom? Thank you Dr. Fudin for this great work and teaching the use of the Evzio pen. I really hope this video is watched by many people including pharmacy CE license renewals. Donna, good question. Where is the American freedom? From what I can gather, we gave it over to the corporations who the supreme court has allowed to contribute endless amounts of money so now we have a Republican controlled house and senate; they also control the Florida legislature under the jurisdiction of Pam Bondi who prides herself on cleaning up the pill mills. But in this act, they have left the people who are truly suffering just hanging with no answers…no message, nothing but questions. Did you see how Washington DC voted to legalize marijuana? Well, apparently our Republican congress didn’t like that and just decided to cancel that. So you see, this idea of freedom is really an illusion when they can just decide to not abide by what Americans actually voted for. I hope the video I posted about the Minnisota mother who gave her son cannibus oil posted on the Fight for Pain Care website here as it is stunning how she is being treated like a criminal. Forgive me if I don’t have the exact details. Anyone can google this subject as well as I can. I am just fed up with being denied medication I’ve taken for years and yet I don’t even have the free choice to try the cannibus plant that has never killed anyone.